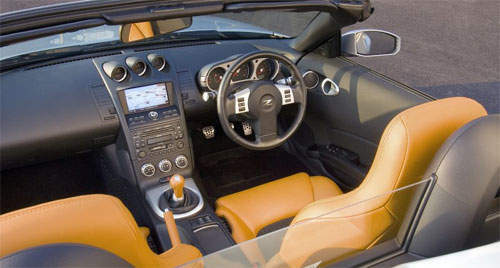 Nissan has launched a facelift of it’s flagship sports car, the Nissan 350Z. It’s not just a facelift though, the new engine comes with some re-engineering that gives it a little more power and a nicer torque curve. The new 2006 Nissan 350Z has a restyled bumper, new headlamps and tail lamps, new sports rims on the exterior. The interior has also been refreshed, with different materials used, more storage space, a speed sensitive power steering and Bluetooth phone integration with the sound system. Under the hood, Nissan has updated it’s VQ35DE engine 3.5 litre DOHC V6 engine. The new VQ35DE revs higher, resulting in higher horsepower of 300ps at 6400rpm, up from the 280ps at 6200rpm previously. The redline is now 7000rpm instead of 6600rpm. However changes in the engine tuning caused a small torque drop to 353Nm, where it was perviously 363Nm. But the torque curve is different now, with more torque at the high revs than the previous engine. Other enhancements include new pistons, revised intake manifold, revised camshaft profile and variable exhaust valve timing. 0-100km/h times are lower by 0.1 seconds now, what used to take 5.9 seconds takes 5.8.